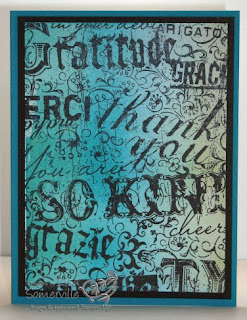 The new Gratuitous Graffiti background stamp from SU makes making Thank You cards a breeze. This card takes less than 5 minutes to make. I used the Spectrum Roll Technique and my Caribbean Sea K Pad to create the background. Heat set the ink to speed up the dry time of the wet ink, stamped my image in Black Archival then mounted on my black panel and teal base card. Love this idea! Great card! There is an "I Love your blog" award waiting for you on my blog! Hi, Lisa!!! Cool card -- love it!!! And HUGE CONGRATS! on your page in Take Ten -- you never said, you stinker!! Also, congrats and good luck on the JR contest!!!! You have had some FABULOUS projects with your monogram stampers -- keep them coming -- I LOVE the inspiration they give me!!! TFS!!! This is so cool! You Rock!